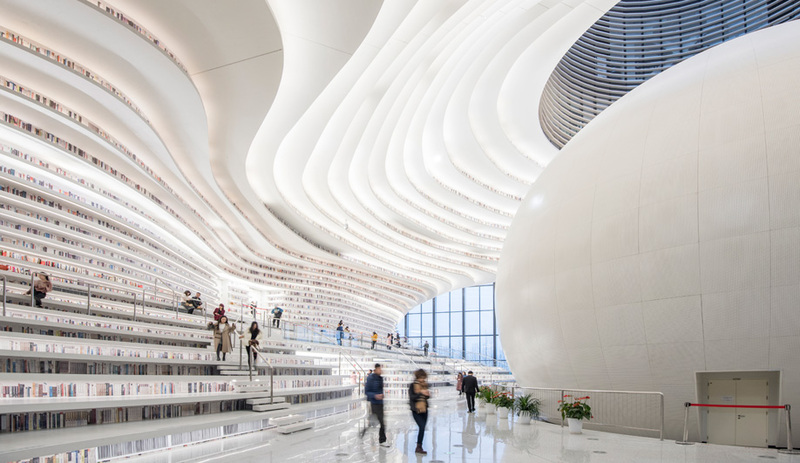 Dutch architect Winy Maas of MVRDV, who will be speaking in Toronto on June 23 as part of Azure Talks, details building the Tianjin Binhai Library, which is home to 1.2 million books. 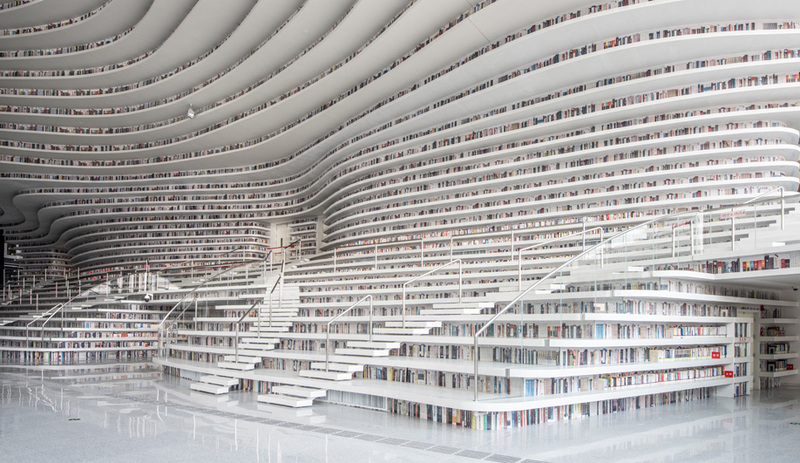 In the coastal city of Tianjin, the idea of building a monument to books, and knowledge, is a challenging one – China is not a country known in modern times for celebrating the free flow of information. 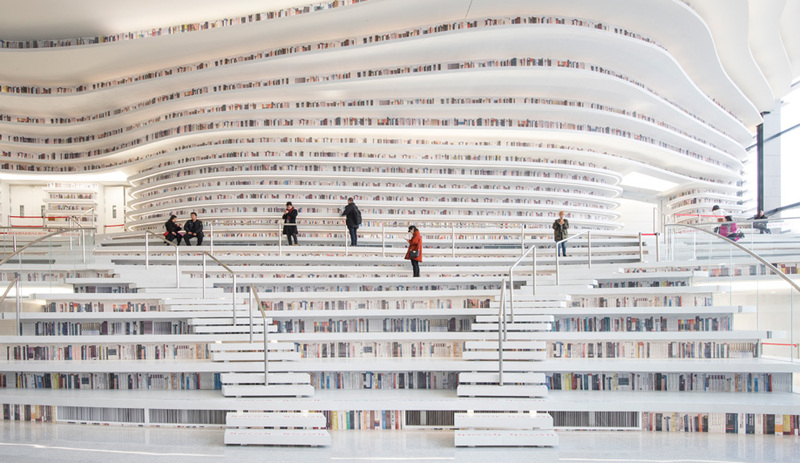 Designed by MVRDV of Rotterdam, in collaboration with local partners Tianjin Urban Planning and Design Institute (TUPDI), the Tianjin Binhai Library reaches for something ancient in imagining a library of the future. It’s a vast cave formed to house up to 1.2 million books within a five-storey-high stream of undulating shelving. A spherical auditorium at the centre watches over the 33,700-square-metre space like a luminous, all-seeing eye. This is a place to get physical with books, to crawl in and amongst them, and to let them overwhelm you. Working within a master plan by GMP of Germany, the library forms part of a larger cultural complex of five buildings. 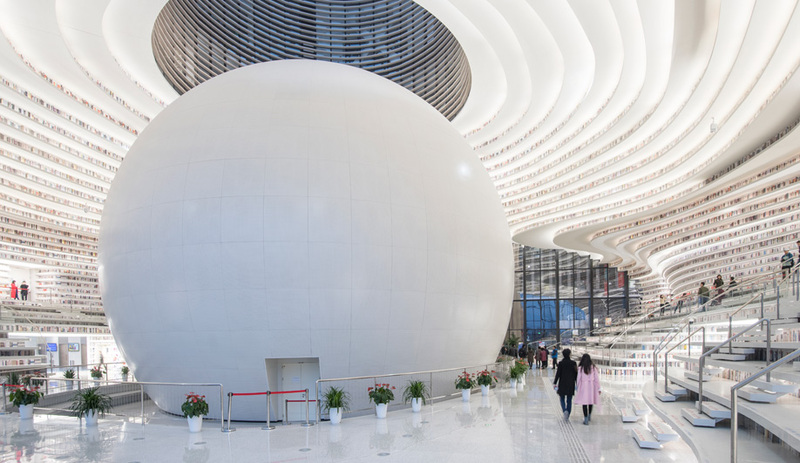 Despite appearances, the Tianjin Binhai Library wasn’t all about unfettered imagination and whimsy. 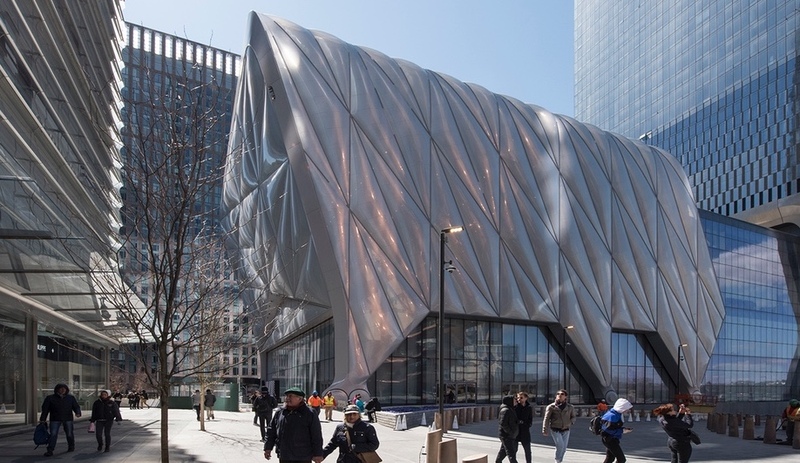 It was, for MVRDV, more of an exercise in very particular limitations, including a tight time frame, a mandated local design partner, a strictly fixed volume and exterior, and fewer books on the shelves than planned. 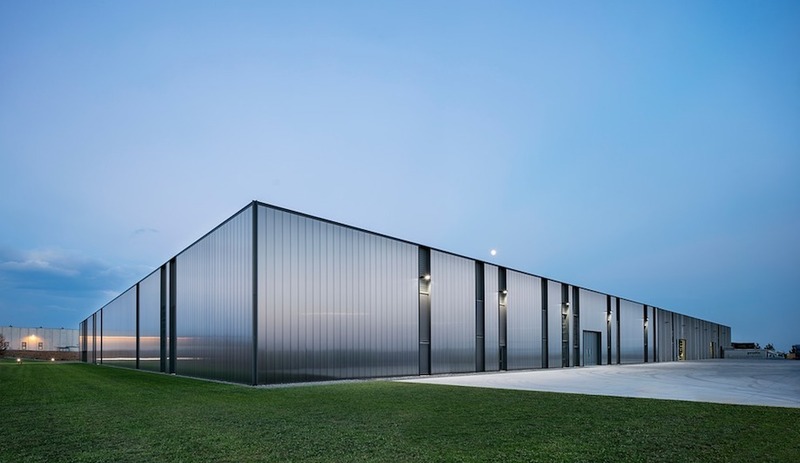 As founding partner (and the AZ Awards’ 2018 Guest of Honour) Winy Maas tells Azure, even when you are given the chance to flip the table over and imagine an entirely new form of an established building type, a fast-tracked project can mean compromises that you’re not going to love but will have to live with. 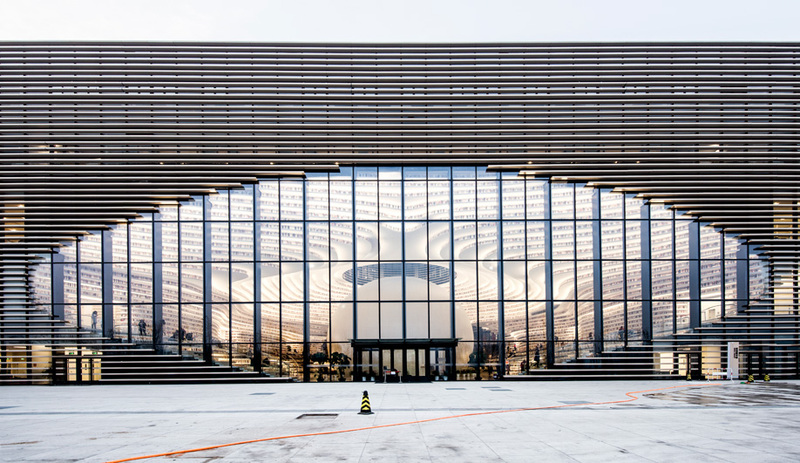 The Tianjin Binhai Library seems to be less about the functional, multidisciplinary aspects of a modern reference library, and more a tribute to the idea of physical books, knowledge and learning. Can it be both? The client wanted a place where people could gather and mingle, and where there was easy access to books. They wanted a library where you could see books in every corner… if there were corners [laughs]. We followed that brief by suggesting two things: One was to put the auditorium in the very heart of the space, as a kind of motor that functions 24-7; and two, to surround that with this collective space. We designed it so visitors could simply walk over the books from top to bottom. Is it functional? Yes, there is a sequential system in place so you can find particular books in each layer. Every layer has a name, and they are placed in order, so the books are searchable. The central library will evenutually contain a specific collection – it’s what they call the World Collection, where you can read about thoughts and ideas from around the world. Many books aren’t actually on the shelves, they are in the rest of the building, so the [main hall] is representative of a much larger collection. The librarians can curate it, so the ordering of the books will change over time. How has the library been received locally since its opening last October? Maybe you’ve seen images of the weddings that have already taken place there? I think that’s one answer. There aren’t that many big libraries in China, so to have a place where the books are central, and also very accessible, is partially political by intention. 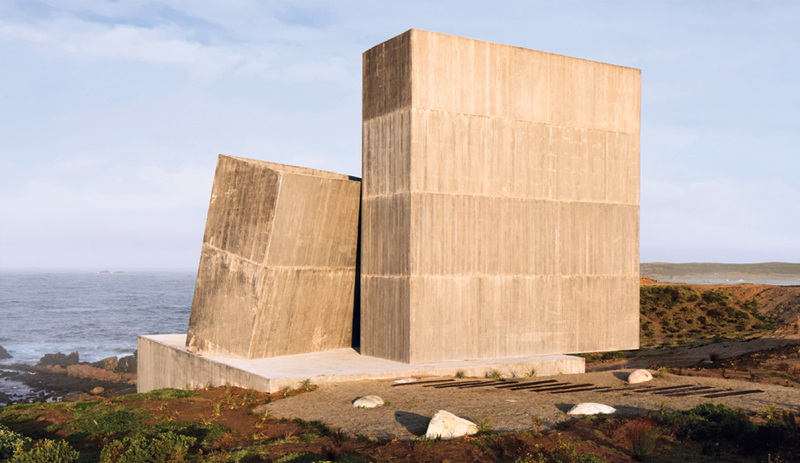 It’s a public space, so it naturally provides access to knowledge, and that is really appreciated locally. In general, libraries in China aren’t big. In fact, there are fewer publications in China than in other parts of the world. I would encourage them to publish and translate more, and to open the frontiers. Only 15 rows, however, actually house books. The other 45 contain images of book spines – a controversy that is a result of the project’s fast-tracked execution and the politics of working in China. You call this fast-tracked project your “most rapid to date.” The entire project was designed and built within three years. I get the sense the excavators were ready to go as soon as you had half a sketch done. What did that mean in terms of compromises along the way? There are pluses and minuses. The plus is that the concept was adored very quickly and there weren’t many revisions. It’s also nice to have a project finish much faster than usual. The disadvantage is that working with the local firm and with the ciy is not always smooth or easy, because you need to communicate a lot, and there just isn’t enough time. We were sometimes surprised by their choices, and we couldn’t always pull things back. Sometimes we could, but not always. That’s the risk. In one case, it was particularly unfortunate. The decision to avoid (for the moment) fire protection in the central space, and access to the shelves that are nearest to the ceiling – due to budget and timing constraints – that is a real pity. Now, only 15 of the 60 bookshelves contain actual books. The other shelves contain images of book spines. This shows the potential of the space, but we’re all aware this needs work. There’s been quite a bit of press about the fact that some of the books aren’t real. Then there were stories going around that there were hardly any books at all, and maybe authorities have asked for books to be removed. From your perspective, what is the reality of the situation? Well, it’s clear communication hasn’t been the easiest part of this project, but, yes, they couldn’t afford some of the costs involved in fire protection, so there were compromises made. But the shape of the library has been respected. We’ve had good conversations with the librarian, and he’s very happy the building is getting so much attention and that people like it. He’s also eager to have more people visit. The collection is not that big yet, and it needs to grow, but how that changes will depend on policies. In the meantime, we’ve put together a list of what needs to be developed, and there will be improvements on safety and fire issues. It’s not dangerous now. They did a good job in that way. Basically, in order to facilitate more books we need to add fire protection, including steel on the higher levels, and more smoke detectors. This is a subject that’s close to my heart, and in a way it’s much bigger than what an architect can take on. I mean, some people say, Why don’t you put books from the U.S. or Europe on the shelves? But I can’t break the rules. We’re now in a diplomatic world, and it’s my job to figure out how to operate in that world. You can clearly see we have done something provocative with this project – we have facilitated a larger possibility for access to knowledge, and towards written knowledge especially. And that is what it’s about. That’s what I can do. What have you learned from this project that you’ll take into the future? Basically, that you have to concentrate on one element. Otherwise, you have to be relaxed about the process, and be prepared to give things up. But let’s not forget that in China you’re also obliged to work with a local firm [in this case, the Tianjin Urban Planning and Design Institute]. Some of these firms are at an international level, and others are not, but no matter what, you’re simply not going to be the voice on everything. This is the second library for MVRDV, after Book Mountain in Spijkenisse, the Netherlands. What are the specific challenges of working with libraries? With the first one we were trying to say that we believe books still play a vital role in the world. Of course, we are in a digital era, and a younger generation is doing things other than read books, so it’s logical to digitize them. But I think that for the next 30 or 40 years there will still be a desire and need to have physical copies. Will that change? Probably, yes. We have discussed this question a lot. We believe in keeping public spaces that celebrate access to the knowledge books represent, and to use those spaces to discuss the development of human knowledge. There is a tendency to have only the latest books on library shelves and then destroy the older ones. Our “shelf projects,” like the one we created in Spijkenisse and now in Tianjin, tend to have many more shelves, so you can have older collections accessible too. Our experience with both projects is an appreciation from readers, who want to see a large number of books and to see how they’re ordered. They feel almost overwhelmed, but also inspired and challenged. Seeing so much written knowledge encourages people to read, more so than in libraries where books are kept in stacks – especially those built in the 1990s – and the experience is more like a labyrinth. 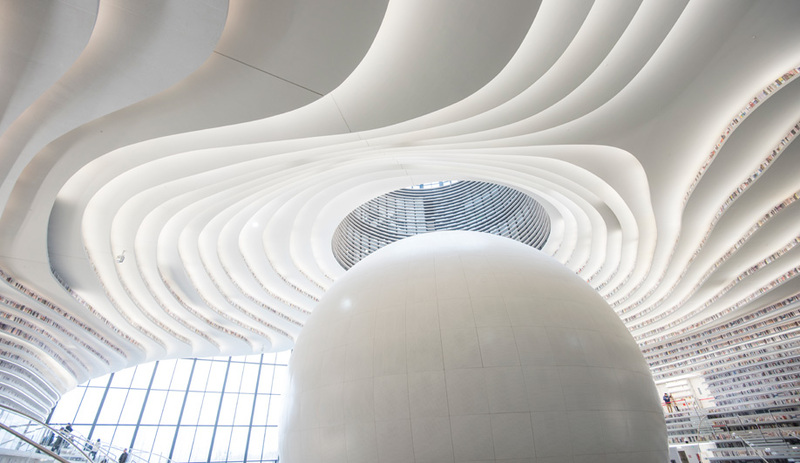 Both Book Mountain and the Tianjin library have this monumental impression that inspires. I compare these projects to those by library designers from the 18th century, who were also aiming to show off books. For me, those libraries are always inspiring. They somehow make me want to hang around longer. They seduce me to read the next book. The library, open since October 2017, has been dubbed “The Eye” in reference to the spherical auditorium at its centre, which, when viewed from the plaza outside, resembles an iris. 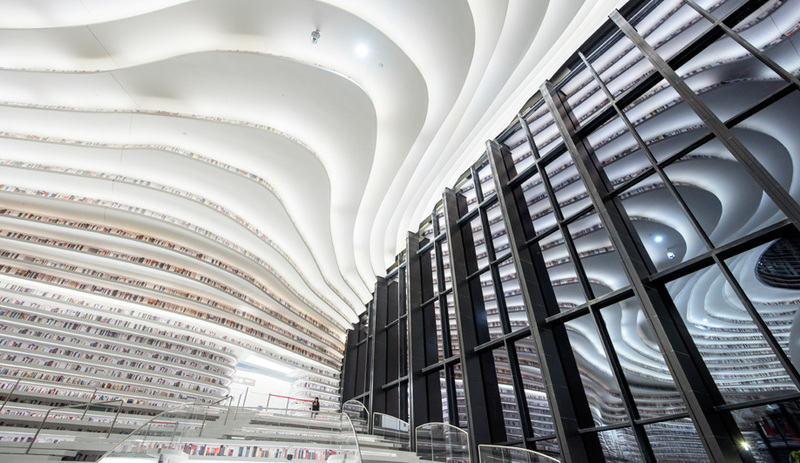 The Tianjin library is part of a five-building master plan that has a glass canopy enclosing the entire space. Did you have much input into how the overall space could work, or what your building could bring to it? It must have been a challenge to realize the kind of monumental spectacle we’ve become used to in your flagship projects. Is it possible to put MVRDV’s mark on a purely interior project, without that capacity for exterior play? I’ve written before that, with greater densification, the role of the interior has become more important than the exterior, because we are simply closer to each other inside. That really applies with this project because the buildings are packed on top of each other, with just this small space in between. Climate change, not only in China, but also in other places, is making interior spaces more significant. 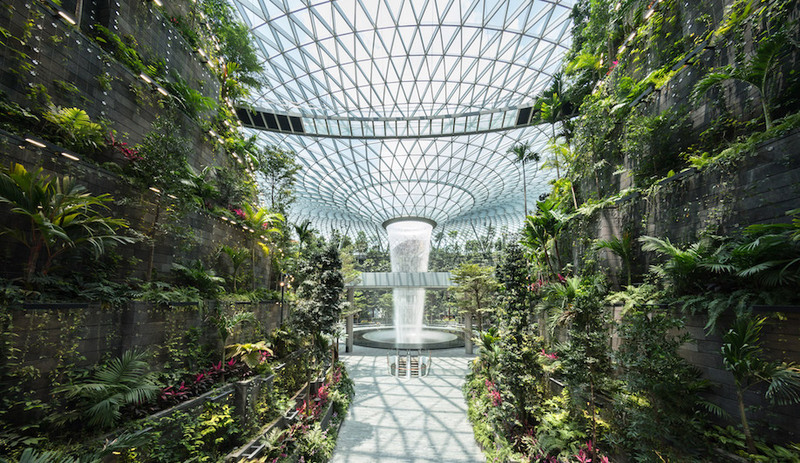 Yes, we have to find an ecological solution for climate change, but it again puts the emphasis on the interior and air-conditioned spaces. I think our first project, the Villa VPRO [a new home for the Dutch public broadcaster, that was completed in 1997], was also a building about the interior, where the exterior was simply a leftover which basically shows the story of the interior. 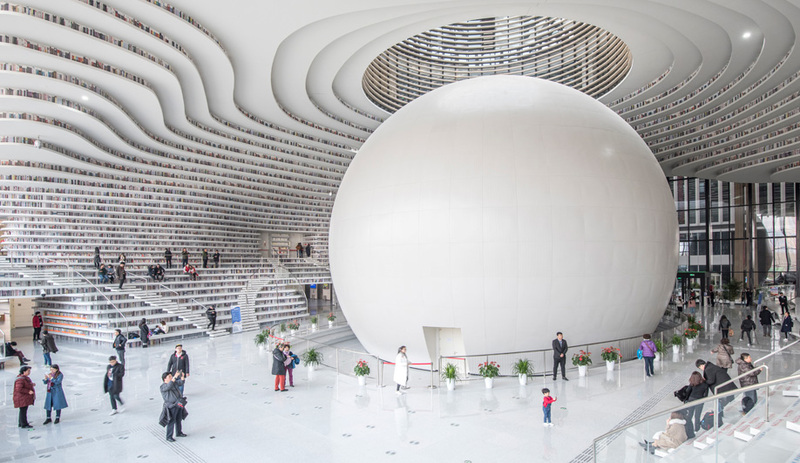 With the Tianjin library, the experience is in the space itself: To step on it and to try to find your way over the shelves, that’s quite a physical experience. That’s the most important part.